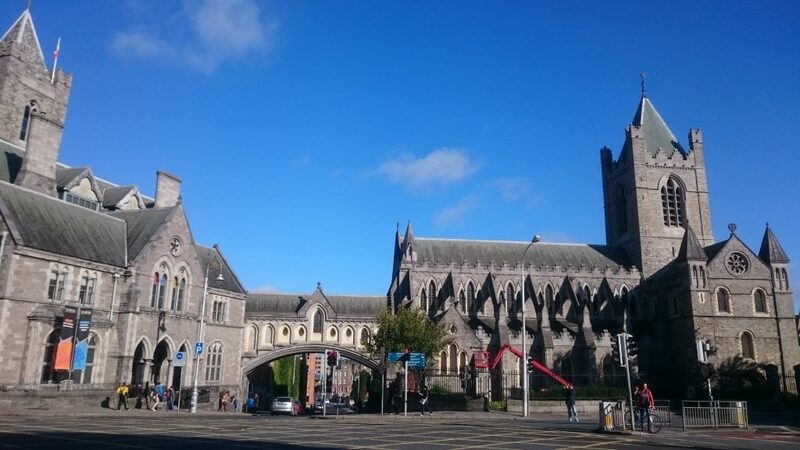 Christ Church Cathedral was a royal foundation by the Hiberno-Norse King Sitric Silkbeard at a prominent site within the Dún of Dublin dating to the 1030s. That any of this building survives in the cathedral crypt is the subject of debate. 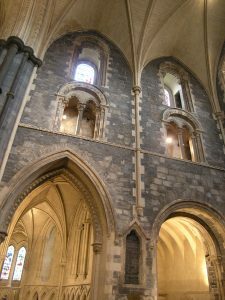 A major building campaign in the Late Romanesque style was undertaken from the 1190s under the aegis of the first Anglo-Norman archbishop of Dublin, John Cumin (1180-1212). A three-storey elevation in the transepts is decorated with chevron ornament and historiated capitals, features also found in the choir arcade and aisles. As an Augustinian Cathedral Priory only the ruin of the Early English Gothic Chapter House south of the Cathedral give any indication of the former cloistral arrangement. Christ Church’s nave is the jewel in the crown of the Early English Gothic style in Ireland. The integration of the triforium and clerestory stages with polished shafts is very accomplished, the rather squat octagonal piers are embellished with triple filleted shafts, deeply undercut stiff-leaf capitals (some have carved heads), and sinuous soffit roll bundles. These features are reminiscent of similar detailing in Wales and the English West Country, and this building was hugely influential in the spread of these features within Ireland. The choir was extended by several bays in the 1350s by Archbishop John de St Paul. 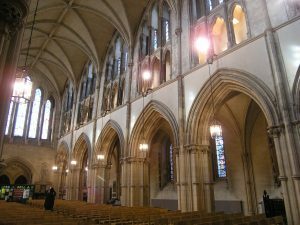 Unusually the priory cathedral it was not dissolved at the Reformation, its links with the merchants and citizens of Dublin persuaded the authorities to convert it into a secular chapter with the prior becoming dean. The south wall of the nave collapsed in 1562, thereafter for 300 years cathedral services were located in the long choir. In the first decade of the seventeenth century the cathedral cloisters were converted to house the Four Courts of Dublin, only finally vacating this location for Inns Quay at the beginning of the early nineteenth century. The activity of the Wide Street Commissioners in Christ Church Place, the gradual removal of the defunct Four Courts buildings and a restoration campaign in the early 1830s transformed the southern aspect of the cathedral. 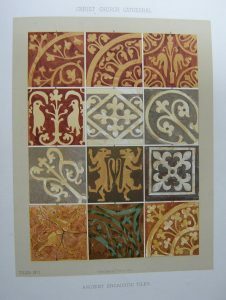 The major restoration of the cathedral was undertaken by George Edmund Street between 1870 and 1878, employing in equal measure forensic scholarship and hardly justifiable innovations. This campaign saw breath-taking feats of engineering, careful recording of elevations, plans and details, meticulous restoration and copying of parts and at the same time, paradoxically, a willingness to create plans and elevations based on an ideology of (creative) conformity to the building style of one period of the Middle Ages at the expense of every other. The tension between exquisite medieval architecture and High Victorian Gothic is one of the great attractions of visiting and studying this cathedral.